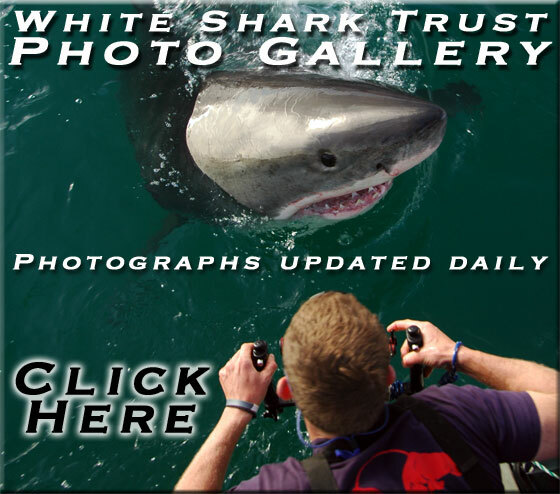 Established in 2002, the White Shark Trust conducts and supports research and conservation projects on the endangered Great White Shark (Carcharodon carcharias). White Sharks have been protected in several key regions around the world: South Africa (1991), Namibia (1993), the United States of America (1997), Australia (1998), Malta (2000) and New Zealand (2007). These conservation plans were not based on scientific evidence about the White Shark population, but mostly on the observed decline in the number of large sharks caught by fishermen. White Sharks have been listed on the Appendix II list of CITES in October 2004. At present, our knowledge about these sharks is not sufficient to determine the status of the species, and studies must be conducted in order to gather enough valid scientific information about the White Shark population and biology. The White Shark Trust was established to attract and manage funds that allow research projects to be conducted on White Sharks. Michael Scholl, Founder of the White Shark Trust, is conducting and leading different research projects around Dyer Island in South Africa. The research conducted around Dyer Island and in Shark Bay by Michael Scholl and the White Shark Trust represents the longest ongoing and most intensive population study of White Sharks in the world. Over one thousand different White Sharks have been identified since 1997 using a photographic identification methodology developed by Michael Scholl, and over 6'000 Shark observations have been catalogued in the White Shark Trust database. The White Shark Trust needs your support in order to be able to continue our fieldwork and projects. The future of this very important population study depends on securing major funding during 2006. White Shark Trust Epilogue or Intermission? Despite considerable and continuous efforts to locate and secure the required sponsorship and funding during the past few years, the White Shark Trust and Michael Scholl were unfortunately unable to secure the necessary funds to continue the field research and the general activities of the Trust. The Great White Shark photographic identification research project and its associated population structure and dynamics research project started in October 1997 and continued for nearly a decade until January 2007. It is a shame that the longest continous research project on any population of White Sharks in the world had to come to an end due to lack of funding and lack of support from the South African authorities. But so is the fate of many research projects and for many colleague scientists around the world unfortunately. It is a shame that our successful assistantship and internship programs had to come to an end. We welcomed over 120 field research assistants over a period of five years. Michael continues to seek funding to further future Shark research and conservation projects and hopefully again resume the White Shark Trust activities. The 1997 to 2007 period represents an amazing era of discoveries (e.g. 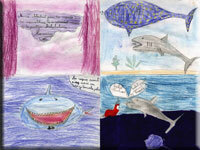 Nicole, South Africa's Great White Shark book), hardships (e.g. Authorities, Salmon Farm battle), and most importantly, countless wonderful memories (illustrated partly in our Photographic Gallery), and encounters for Michael, his wife Tracey, their colleagues, friends, assistants, all the people and all the Sharks who shared their lives during that time. The White Shark Trust and Michael Scholl also wish to express their most sincere thanks to all the sponsors and private donations that enabled the White Shark Trust and made these research and conservation projects possible. Thank you very much! I also wish to thank the 15 to 20 thousand different visitors we get every month on this web site, and I know that the end of the photo gallery has been sad for many of you (and for us) who shared your thoughts with us. Hopefully one day we will be able to resume the Shark gallery once again! 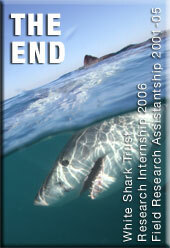 Coming soon during 2008, the complete White Shark Trust population database will become available. 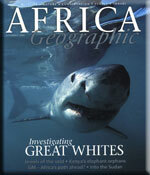 Mark Carwardine reviews Michael Scholl and Thomas Peschak's book 'South Africa's Great White Shark'. The acclaimed BBC Wiild life Magazine voted this book as Book of the Month in the December 2006 issue. 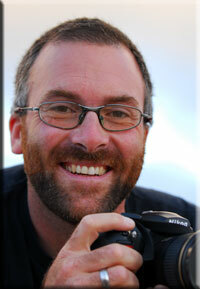 Michael Scholl left Gansbaai at the beginning of February 2007. He first went to Dubai in the United Arabe Emirates to spend some time with Tracey and to live an incredible adventure to the Galapagos of the Indian Ocean: The Socotra Islands. You have followed his life for the past few years on this web site, you can continue to follow (part of) his life through his blog. Enjoy! For many years, Gansbaai or Goose Bay has celebrated its own Goose Festival with mitigated success. Competing with the world famous Whale Festival of Hermanus every year, Geese just did not seem to fit the profile. 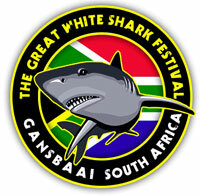 Finally in 2007, the Great White Sharks will be celebrated in South Africa and hopefully this festival will represent a new era of understanding and conservation for all Sharks in the world! Lack of funding and sponsors signified the end of our independent field research work on board the dedicated research boat Lamnidae, as well as the end of the popular and successful Field Research Assistantship at the end of 2005. Unfortunately, due to continued lack of funding, the end of 2006 corresponds to the end of the Research Internship which ran during 2006. 30 November 2006: White Sharks have been protected in South Africa (1991), Namibia (1993), the USA (1997), Australia (1998) and Malta (2000), but one known hotspot was missing: New Zealand. 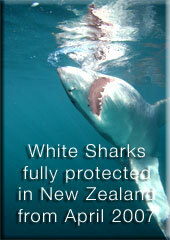 Lead by Conservation Minister Chris Carter, New Zealand has closed this gap sixteen years after South Africa initiated this movement, and from April 1997, White Sharks, or White Pointers as they are called in New Zealand, will be fully protected in the EEZ of New Zeland, including around the Chatham Islands. 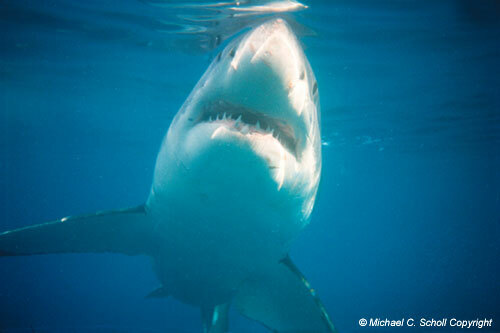 Great News for White Sharks and Sharks in general!!! 11 October 2006: Michael Scholl and Thomas Peschak are proud to introduce you to the reference book on Great White Shark, with special emphasis on South Africa's Carcharodon carcharias. Everything you always wanted to know about these wonderful Sharks... Including the intimate story of Nicole and her epic journey from South Africa to Australia, and back, and the intriguing behaviour of these Sharks near beaches... among many other chapters! 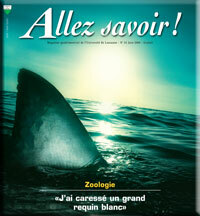 Allez Savoir, the magazine of the University of Lausanne (UNIL) in Switzerland, has published a special feature about Michael Scholl and his research and conservation work on White Sharks around Dyer Island. 18 July 2006: Sir Bobby Charlton discovered White Sharks on board Shark Fever with Marine Dynamics. Manchester United is playing some of the local South African football team. 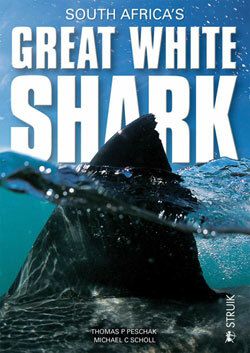 In June 2006, the famous french documentary program Ushuaia Nature is filming Great White Sharks around Dyer Island. It was an honour to meet Nicolas Hulot and his scientific adviser and aclaimed underwater photographer Laurent Ballesta. A stranded Pygmy Sperm Whale was found by fishermen near Cape Agulhas in mid-July 2006. 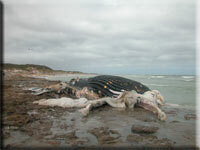 Wilfred Chivel is organising for the carcass of the rare whale to reach the authorities in Cape Town for autopsy. Read about Nicole's journey as it was published on the 7th of October 2005 in the Science Journal: Transoceanic Migration, Spatial Dynamics and Population Linkages of White Sharks. 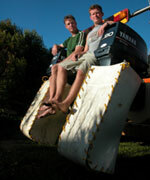 White Shark Cage Diving Industry soon to be regulated? DEAT and MCM have published a draft of the proposed new policy and regulations for the commercial cage diving industry... Read the draft and the comments and recommendations written by Michael Scholl. 15 April 2006: The German television RTL is broadcasting a special documentary about White Sharks on their Explosiv Magazine. Markus Lanz presented this show filmed around Dyer Island during March 2006. Information posters have been erected at the Uilenkraalsmond beach and in Kleinbaai harbour informing people about the Sharks swimming near the beaches, and giving some tips to avoid unfortunate encounters. Read our article published in December 2004 also. This new program replaces the 2001-2005 Field Research Assistantship program. Students and Shark enthusiasts are welcome to apply for this 2006 program to gain both field and shore based research experience, as well as experience in eco-tourism. 7 October 2005: A 3.8 meter long female Great White Shark, tagged at Dyer Island with a PAT satellite Tag by Ramon Bonfil (Wildlife Conservation Society) and identified by her unique fin-print by Michael Scholl (White Shark Trust), has completed the first known transoceanic return migration, travelling farther than any other known Shark, more than 20'000 kilometers from South Africa to Australia and back again in less than nine months. The article published today in the scientific journal Science will change long-held notions about how these charismatic predators move through the world's oceans. This special event on the 24th of September 2005, at the Museum of Zoology in the Palais de Rumine in Lausanne, Switzerland, was a tremendous success in honour of the freshly renovated largest naturalised White Shark in the world... and all the live Great White Sharks! Come and celebrate the launch party for the World Awareness Tour at the Havana Bar in Chichester south of London on the 1st of October 2005. During the 'Nuit des Musées' or 'Night of the Museums' event in Lausanne (Switzerland) on the 24th of September 2005, the Zoology Museum is celebrating the largest conserved Great White Shark in the world and centering its activities around Sharks. Presentations, videos and slide shows by Michael Scholl, and projection of Spielberg's Jaws at midnight. An article written by Tom Peschak and Michael Scholl, published in the September issue of Africa Geographic, investigates the mystery surrounding the White Sharks swimming close to the beach and proposes some theories and explanations. The award winning photographs of Tom Peschak (Currents of Contrast) are stunning as always. Available in shops now! 01-15 July 2005: National Geographic Series Producer Sue Houghton, Associate Producer Becky Beamer, and cameramen Andy Mitchell and Mike Rodgers came to South Africa to shoot the White Shark episode of this new series. Michael Scholl was hired as the investigator and biologist for the episode that should be broadcasted in October 2005. 25 June 2005: The first movie to ever gross 100 million dollars in North America is thirty years old... but apart from being one of the first blockbusters, this movie is unfortunately at the origin of the Sharks' demise around the world, the main reason for the general hatred against Sharks and especially White Sharks... But this movie also sparked interest in some people, and maybe promoted research on these misunderstood and mysterious fish. We loved these TV adds so much that we just needed to share them with you... We all need to have a good laugh in life! 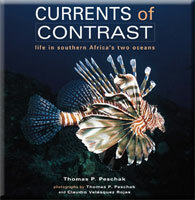 Thomas P. Peschak's 'Currents of Contrast' book is now available! 13 April 2005: Anyone interested in the marine world and especially about the marine ecosystems along the coastline of Southern Africa must get this book! Amazing and exciting photography, accompanied by a fascinating and very informative text. Struik Publishers launched 'Currents of Contrast' at the Two Oceans Aquarium in Cape Town, an event sponsored by WWF. In November 2004, Brad Pitt discovered and fell in love with White Sharks in Gansbaai. Celebrities can play a very important roles in helping conservation of endangered animals. Gansbaai Salmon Farm - An Ecological Disaster! 2 April 2005: A aquaculture farm sponsored by Norway has established itself in Gansbaai. They are farming an alien fish, and their neighbours are White Sharks, Seals, Dolphins, Whales and Marine Birds! Danger! In November 2004, four White Sharks were tagged at the Neptune Islands in South Australia with satellite tags... Follow the weekly updated movements of these Sharks! White Sharks like the beach too! During the summer months, White Sharks swim very close to the beaches, in less then three-meter deep water within the surf zone. Be aware and beware, but NO need to panic! On Friday the 29th of October 2004, IZIKO opened a new exhibit 'Shark World' dedicated to Sharks at the South African Museum in Cape Town. Shark World, sponsored by the Save Our Seas Foundation, is a must-see for anyone interested in Sharks. On the 12th of October 2004, the joint proposal from Madagascar and Australia to list Great White Sharks (Carcharodon carcharias) on CITES Appendix II was accepted at the 13th Meeting of the Conference of Parties of CITES. Andy Brandy Casagrande IV, a previous White Shark Trust Field Research Assistant, has released a CD including his famous 'Great White Shark', 'Poacher' and 'Pitbull' songs. To listen or buy this great CD just follow the link. On the 24th of September 2004, a White Sharks was spotted in Salt Pond on Nashon Island, off Woods Hole in the USA. The Shark seems to be trapped in the pond and may have difficulties finding its way back to the open ocean. On the 14th of September 2004, the Monterey Bay Aquarium in California placed a juvenile White Shark on exhibit. Is this the end of White Shark's freedom? Will this Shark help the conservation of this endangered species? On the 10th of September 2004, Yakutat charter boat skipper Mark Sappington observed a White Shark taking a bite of a Halibut that was being reeled in by one of his clients. Jean-Claude LORTAL from Montpelier in France was diving in Mauritius / Ile Maurice, when he encountered a three meter long female Great White Shark. The account of an amazing story! 12 May 2004, Geneva, Switzerland  The Secretariat of the Convention on International Trade in Endangered Species of Wild Fauna and Flora (CITES) has received over 50 proposals from its member governments to adjust the rules governing the international trade in various wildlife species. Madagascar and Australia propose adding the Great White Shark to Appendix II. No sharks were included in Appendix II until two years ago, when the Whale Shark and the Basking Shark were added. Alison Kock and Karl Laroche are conducting an extensive Behavioural Ecology of the Great White Shark around a Cape Fur Seal colony in False Bay. The project is looking for a volunteer assistant for 1 May - 31 August 2004. 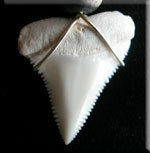 White Shark teeth sale... Busted! Have you seen this photograph in the newspapers? Maybe you have seen this image on the web? 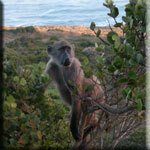 If you would like to become involved and assist in the field research work at Dyer Island. Here is your opportunity to join the field research and get experience! We are very proud and happy to present and thank the growing list of Individuals, Companies and Organisations who allow our field work, research and conservation efforts to continue and expand. In September 2001, Michael Scholl acquired a 21 ft catamaran boat to conduct the field research at Dyer Island. This boat is equiped with all the necessary equipment. In 2002, the White Shark Trust is welcoming two South African students to conduct their field work for their Honours Projects at Dyer Island.